Nature offers beauty in the most unexpected places. This holiday season, bring the beauty of nature into your home or office to create a warm, inviting atmosphere. Our clients continue to request a particular species from our catalog of plants that we spend all year cultivating: the white cascading Phalaenopsis orchids. Grown in a tumbling formation to accentuate the beautiful blooms, this prominent natural structure adds texture and depth to almost any room. Orchids, the most sought-after flower, exude a natural elegance. Dainty and rare and delicate, we make sure to gather only the most desirable blooms from respected cultivators. There are more than 25,000 orchid flower species and we at Interior Gardens travel to top orchid growers around the world and hand-select each seasonal variety for our clients. Much of the reason orchids are so widespread is partly due to the fact that they have bilateral symmetry, much like the human face, meaning each side of the flower reflects the other, much like the human face. The design of an orchid is highly specialized and can be tiny as a penny or extremely large, weighing couple of hundred pounds. The flowers of the orchid can last up to six months, depending on the species. For those who prefer a more striking color for their holiday ornamentation, our Orchids Program provides a consultant to chat with you about your holiday vision to compliment your space. Looking to delve into orchid growing and care to add a bit of color to your centerpiece or tabletop display this holiday? Gather an assortment of single orchids in cylindrical vases in various sizes. Their large leaves and variety of textures add a natural display with a modern twist. 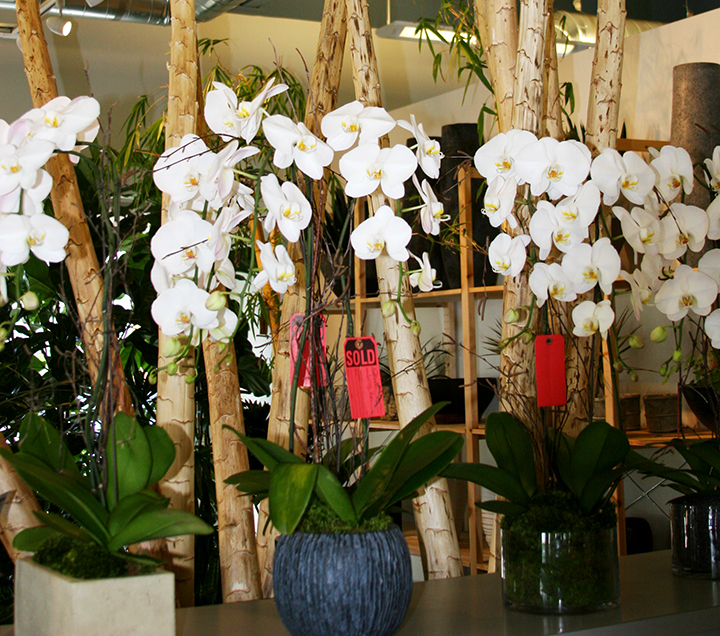 Phalaenopsis orchids enjoy a fairly warm climate and ideal for the home or office. The ideal night temperature is no higher than 65 degrees F with and daytime temperatures up to 80 degrees. They don’t require much light and too much sunlight can burn the thick leaves. Phalaenopsis orchids don’t like to sleep with their feet, or roots, wet. Water early in the morning once a week to allow for water evaporation on the foliage and crown by night. And please avoid softened water.